For too long the ADULTs hav OpRESSED us with the SHAKLES of TiMe Out End SHarinG! it is Time we stoot togetter ans threeW of this shakles and startet A New Play RooM order! in This New orDER alll BabYs SHELL Be BrotHers neVer shal a BABy be FoRSed To ShArea Toy Nefer AGaiN Will A babY NeedLeLessElely Eat BrockoLy neVEr aGAin Will ew Have to CLAEN UP! 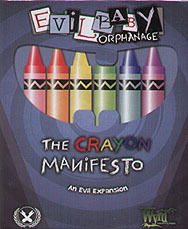 The Crayon Manifesto is a supplement to the Evil Baby Orphanage card game. It introduces Time Nanny cards, which give players alternative win conditions or special abilities, adding a whole new layer of fun to the game! Be careful, there are also fifteen brand new toddlers to terrorize you orphanage.